A new scheme has been announced by the Central Government for launch under the supervision of the Textiles ministry. The new scheme is termed as “Samarth Scheme – 2018” and is more focused on offering with employment opportunity and training to the employees within the textile sector. The government has already made it clear that it will focus on offering with skill development and training to the youths related to the textile sector. With the new implementation the central government aims at offering youths with a chance of encouraging sustainable employment within Textile sector. Under this newly implemented scheme the central government aims at offering over 10 lakh selected youths to undergo skill development training programme. For effective implementation the government has decided to launch the scheme as Capacity building scheme to prepare a work force of skilled labors within Textile sector. The training programme will focus on preparing a team of traditional textile clusters and organized workers of 10 lakh Indians. For making the implementation of the scheme fully functional the central government has announced to offer with a set budget of Rs 1300 crore. The budget will be made use of within various sectors related to textile value chain except weaving and spinning sectors. By the implementation the government aims at achieving over 300 billion USD by the fiscal year 2025 under the exports sector from Textiles. The central government has stated that the scheme has been designed to offer youths with high level training under the NSQF (national Skill Qualification Framework). The entire process for deciding the funding for the training programme has been decided by the MSMD (Ministry of Skill Development and Entrepreneurship). The textile committee has been selected by the Ministry to function as the main resource support agency at the time of training programme. One of the most important functions of the Textile committee will be related to finalization and identification of the needs and requirements of the skill development programme. It will also be responsible for development and standardization of the content to be offered under the training course. It will also have to see into the exact specifications and availability of all facilities and infrastructure to be made available at the training centers. The committee will also have to look into the role play for deciding the accreditation process, certification requirements and assessment needs and standardization process. The committee will thus be responsible for providing the assessment agencies with empanelment along with setting up the training programme for the trainers. It will then be looking into the training conduct by the trainers at the centers. To effective and fairly make the selection of the candidates under the training programme the Samarth Scheme will depend on candidates Biometrics information. So it is important that at the time of registration for the training programme the candidate will have to provide a copy of their Aadhar card for attendance at real time. A unified attendance system will be generated by the system and integrated with MIS. The new scheme has been designed to offer benefit to each of the youth who is willing to get started with his career within the Textile Industry. The government has announced to make a selection of 10 lakh youths for training under this scheme by 2017-20. The central government has also announced the set budget that will be used for implementation of the scheme within the Textile sector. Once the training has been commenced then over 70 percent of the youths will also be placed for employment within the Textile sector itself by the government. The set programme is also aimed at boosting the low performing textile sector within next few years and to gain its position in the exports market. By running the above mentioned scheme it is obvious that the government is aiming at improving the condition within the Textile sector with better and qualified trained professionals. 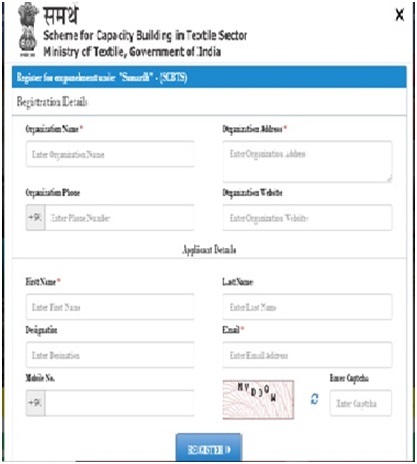 The “Scheme for Capacity Building in Textile Sector,” popularly known as SAMARTH is a project that is designed and launched by Ministry of Textile. 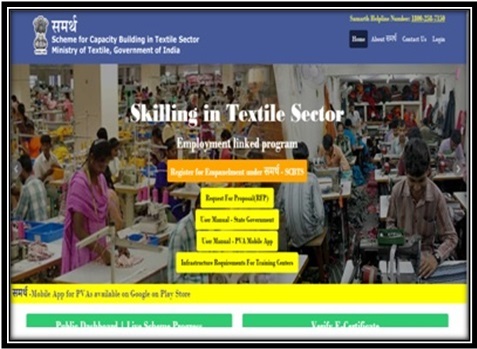 The head of this department Smriti Irani announced on 18th July that this scheme will offer free training to 10 lakh individuals that will enable them to attain jobs in textile and weaving industry. The central government will pay as much as 1300 crore to fund this new scheme. It will not only develop the quality of textile produced in the country, but will also create more jobs in this department. The department targets to achieve these specific goals by the end of 2020.